NEW YORK (Scrap Register): United States silver scrap prices dropped on the Scrap Register Price Index as on Thursday, tracking the down trend in silver futures prices at New York Mercantile Exchange mainly due to the decreased offtake by industrial units and coin makers. The major silver scrap commodities on the Scrap Register Price Index showed a weak trend on Thursday. 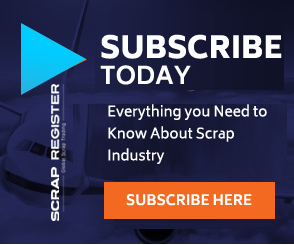 The hallmarked silver scrap prices dropped by 0.56 percent to $12.480 an ounce and non-hallmarked silver scrap prices dropped to $11.078 an ounce. The most active May Silver contract on the COMEX division of the New York Mercantile Exchange has declined by 2.5 percent to $14.867 an ounce on Thursday. Precious metals turned slightly lower for the week, but had seen support earlier in the week as concerns over an economic slowdown fueled demand for assets perceived as havens. Among recent downgrades, the International Monetary Fund this week cut its outlook for global economic growth — the third cut in six months.